Most of the predictions suggest that the robocar could have negative effects on urban density and sprawl. Commutes become much more tolerable if you can work or play during them, and super-tolerable if you can sleep, especially in a flat bed. That could mean people take longer commutes. Since the dawn of commuting, the average commute has been about 30 minutes. Today that's just a longer distance. But as the bus fleets run by Google and other high-tech companies show, people seem willing to commute longer if the commute is nicer -- on these buses you get comfy seats, wifi, tables and you are with your co-workers -- all at no charge. Congestion isn't even really that much of a burden due to the wifi. Does this mean we get a city with nothing but suburbs and even exurbs? Not entirely, because super-long private car commutes will still cost a fair bit of money, and unless you sleep easily in the car, the time is still not as good as work or family time. But some extra sprawl probably happens. Here I'll offer a vision of something in the opposite direction, a new style of dense living for cities. In today's cities, there is a "downtown" but there are many other neighbourhood centers, based around an interesting urban street. On that street are shops, restaurants and more, and it is pleasant and productive to walk around them. Houses near these streets are highly valued, and within a block of the cool street real estate values soar. Real estate ads all advertise these places as "steps from..." the cool street. These local centers are space a mile or so apart in medium density urban spaces, a bit more in suburban areas. For those who live more than about 10 minutes, the cool street is more distant, and a destination for walks rather than the place you live. When you have skyscraper density, as in downtowns and most of Manhattan, there is much greater density of retail streets, and everybody is close to neighbourhood activity and shopping. You just step out of your unit and take the elevator down to be right in the thick of things -- a very walkable space. But most cities consist of lots of land with packed single family homes and townhomes, or apartment blocks 2-3 stories high. 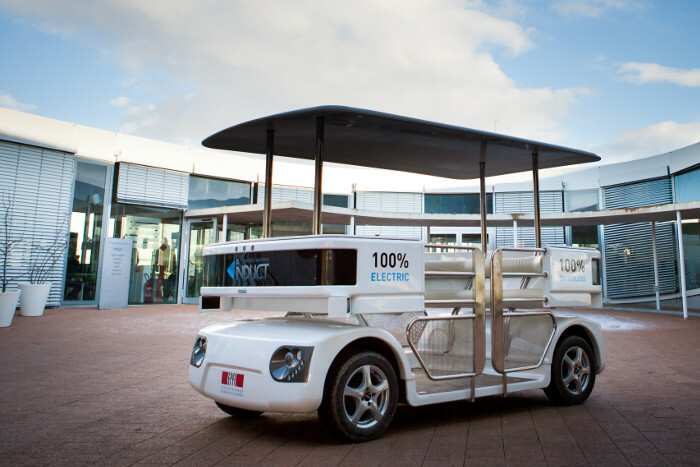 The robocar might create something akin to a "neighbourhood elevator." Imagine a house 3/4 of a mile from the local cool street. In the house is a button. You might press the button and go out. Not that long after you get to the curb, a small robocar pulls up. This is a simple, low-speed model that only goes 30mph. It doesn't have seatbelts, and is tall and not very aerodynamic. You might just stand in it, rather than sit. You get in and it starts heading towards your neighbourhood center. If you like, you tell it a more specific destination along the street and it takes you there. Without belts or low seats, you step out quickly when you arrive in just under 3 minutes. You walk the street, picking up items you like to shop for in person, chatting with friends, perhaps pausing in a cafe to take in the scene. When you are ready, even though you are at the other end of the street, you push a button (this time in your phone) and in short order the "elevator" arrives and you step in to get back home. During periods of high demand, like an elevator it would stop and pick up people going the same direction to ride with you. This ride probably is free to you, or certainly very cheap. The vehicles are simple and not expensive, and either the businesses along that street or your own neighbourhood association are probably quite glad to pay for them to get your custom. (It also means they need less parking and pays for itself quickly that way.) Most importantly, it's as seamless and easy as riding an elevator in a condo tower or a high density area. It could get even more seamless. Imagine all you do is walk out of your home and start heading up the street towards the neighbourhood. Your phone notices you are doing this, and in well under a minute the neighbourhood shuttle slows down to match your pace. If you don't get in, or wave it off, not much energy is wasted, and you go on your way. Otherwise you step in and are soon shopping. When you head back out from that street, your phone probably figures out your needs even faster -- you don't have to do a thing. This gives you a little more exercise and more closely emulates having a house one block away. This seamless experience could make a very large area -- 2 or more square miles -- feel just as close to the walkable space as the houses that are "steps" from it. This in turn will both raise the value of the more remote houses and possibly slightly drop the value of the really close ones who lose a bit of their advantage. (In fact they are noisier so they may lose more of it.) The merchants get a big win with a lot more people who find it trivial to shop this way. Not long ago, we were in a house just 100 feet from San Francisco's Irving St. Chinatown. From this house, 5 dim sum houses were within a 3 minute walk, and it was very easy to use them rather than cooking -- and quite cheap to boot. I also loved a small Asian hardware store that was not much bigger than a Starbucks but seemed to have as many different things as a Home Depot. It was 60 seconds away, and if there was any hardware I needed and didn't have, I could have it very fast -- even faster than I expect deliverbots to get it to me. Or be back for quick exchange if I got the wrong thing. Very different from suburban life, but only available to a very few houses. This experience could be spread to many more people. It's even possible in many of today's suburbs. As the retail streets in suburbs in-fill their under-used parking lots with more interesting retail spaces and make it practical to walk between former strip-malls, they could become highly walkable areas as well. The main barrier is that many suburbs have been designed in a strangely anti-automobile style, considering how the automobile gave birth to the suburb. The streets are not a convenient grid that lets any house have a quick, straight shot to the retail street. Most of the residential blocks are full of cul-de-sacs and in many cases only a few streets connect to the main retail street to help give it fewer intersections and keep traffic moving. Strangely, the neighbourhood elevator concept might see a push to open up pathways, where possible, to the main street from the streets hidden away from it. (These paths could be quite narrow and used only by pedestrians and the elevators.) The subdivisions of the future might find they have very different goals in street design.